More of the same, but with an increased focus on combat and dungeons. If that appeals, The White March may be worth a visit. 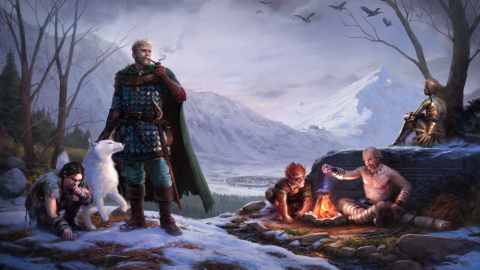 Chilly expansion for Obsidian's excellent CRPG, Pillars of Eternity. If Pillars of Eternity is Baldur’s Gate, then The White March is Icewind Dale—and not just because they both feature chilly, snow-covered settings. The focus in this DLC expansion is squarely on combat and dungeon-crawling, so anyone looking to sink their teeth into a rich story will be disappointed. But if you can’t get enough of Pillars’ deep real-time-with-pause combat, and like a challenge, it may be worth a look. The White March is an area in the Dyrwood’s frozen north. To access it you need to reach the point in the story where the Watcher takes possession of Caed Nua. A letter will arrive and your ghostly steward will tell you about a village, Stalwart, that needs your help. If you don’t have a save from before the point of no return at the end of the main game, you’ll have to start again. When you arrive in the tiny fishing village, it’s being attacked by giant ogres. Repel the invaders and you’ll meet the mayor. She tells you about an ancient dwarven fortress, Durgan’s Battery, that’s been sealed for aeons. If you can get inside and activate a legendary forge, said to be able to make the world’s strongest steel, you’ll bring prosperity to the village, which has been in decline for years. The story isn’t as good as anything in the main game, and there isn’t much of it. It’s really just an excuse to give you two new dungeons to crawl. As well as Durgan’s Battery there’s Cragholdt Bluffs, which is designed for skilled players with high-level parties. Don’t even think about going here until you’re at least level 10. Both are big on tough, challenging battles that will test even veteran players. But you don’t have to go it alone, because The White March features two new companions. Zahua is a strange old monk who specialises in unarmed combat and is covered in self-inflicted scars. They rid him of his vanity, he says, which is part of his religion—and also the reason you first meet him hiding in a barrel of stinking, rotten fish. He’s an intriguing oddball, and really good at punching people. Then there’s the Devil of Caroc, a creepy robot with black eyes that’s been implanted with the soul of a wise-cracking murderer. She’s a skilled rogue, and one of the most unusual companions in the game. It’s just a shame they blow the whole soul-of-a-murderer thing almost immediately after you meet her. I would have liked to have been surprised by that after adventuring with her for a while. There are a few decent side-quests, including one where you get involved in a feud between a local drunk and the owner of the village inn, but mostly they’re unremarkable. The White March is pretty, though. From the bubbling hot-springs and gently falling snow of Stalwart to the rugged, icy mountains near Durgan’s Battery, it’s a nice contrast to the leafy green forests of the rest of the Dyrwood. The White March arrives alongside patch 2.0, which you’ll get even if you don’t buy the DLC. This brings some pretty major new features to the game, including the ability to assign AI scripts to party members. No more endless micromanaging—unless you want to, of course. The enemy AI has been improved too, and sees foes breaking away to engage ranged characters and casters at the back more frequently. The White March is fine. It’s no Throne of Bhaal or Tales of the Sword Coast, but it’s a reasonably entertaining chunk of new quests, and a nice change of scenery. You’ll return from the frosty White March with quality loot in your stash, mountains of experience points, and two new weirdos to adventure with, but not many great tales to tell around the campfire. I’m not sure what Part II of the DLC will entail, but hopefully it has a more compelling story to accompany its dungeon-crawling.